I rarely buy sliced lunch meats from the store anymore, but when I do, I always get whatever is the most “natural”, although now I know more than ever what a loose term that is. I went to get some roast beef today to make French Dip and asked to look at the label. Of course most people never do this, and since they had to pull it out of the big case for me I got “the look”. From what I knew, Dietz & Watson has “OK” meats, not grass-fed, but at least I didn’t think there was any junk in there. “Q: What are Corn Syrup Solids? INGREDIENTS: Beef, Water, Contains Less Than 1% Of Salt, Sodium Phosphate, Dextrose, Maltodextrin, Dried Beef Stock, Caramel Color, Soluble Black Pepper, Garlic Powder, Onion Powder, Grill Flavor (From Vegetable Oil), Corn Syrup Solids, Modified Corn Starch, Lemon Juice, Spice Extractives, Lemon Oil. Coated With Salt, Dextrose, Garlic & Onion Powder, Dried Beef Stock, Natural. In an email from the company, a guy named Steve replied and said that he looked into it and the corn syrup in the roast beef is “only in the coating”. Not cool considering that on their website it says they choose NOT to use corn syrup solids! According to Steve this is the only product they use it in, but that's not very reassuring. A couple of those ingredients often contain MSG (Maltodextrin and beef stock), but he said, “We specify to ALL our suppliers that none of our ingredients can contain MSG.” Again, not very reassuring. My conclusion is that overall their stuff may not be as bad as other conventional lunch meats, but I'm not sure how “on it” they are to know if we can totally trust them. Also keep in mind that their meats are not grass-fed, which is HUGE as you know. (Read why grass-fed/pastured meats are so much better for us.) Wouldn’t it be awesome if they’d offer a grass-fed lunch meat from cows raised on a sustainable farm?! Surely Boar’s Head is a good choice, right? I found no ingredients listed so I had to call to find out if they used High Fructose Corn Syrup in their lunch meats. They asked: “Are you allergic to it?” I said, “Yes, everyone is actually.” Apparently it’s not in their lunchmeat but it is in a few of their other products. I thought I knew the answer to whether or not their meats had MSG, based on the pdf info above, but thought I’d ask just in case. Good thing I did, she said it is added to a few of their lunchmeats! Thankfully, now we can get sliced ham through our local farmer AND my favorite butcher in town, Louise Earl, now offers lunch meats and all their meats are from pastured animals! I just don't trust big companies as much as talking to my farmer about the meat from the animals HE raises, or walking up to my butcher who I trust and who I know has a close relationship with the farms he works with. Have you tried these homemade sub sandwiches?! If you aren’t as fortunate as we are to have a farmer nearby who makes such delicious meats, you can also check out online sources for healthy meat. Read more about healthy meat choices, cooking tips, and what makes meat more or less nutritious. Actually whole deli meats are not made anything like a sausage. The truth is they are often bind together several (3-4) pieces of meat with binders and fillers like soy. When you look at a piece of meat from the deli cut in half you will see anywhere from zero to 4 seams. Boars head usually has 3-4. Dietz and watson has 2 or less. They never allow more than 2 because they don’t use fillers and binders. Rather, they are the only one in the industry to use a specially developed machine, called a tumbler. The machine they use in patented and designed by a member of the Dietz family so they can corner the tech on this. This machine places no more than 2 pieces of meat together to turn until the meats own enzymes cause the pieces to bind together. The pieces don’t hold together as firmly as they do in artificially bound products made by Boars Head and others, but they are better for you because you don’t have all the added junk. And dietz and Watson houses and manufactures items separately to avoid food allergy and sensitivity cross contaminations. They don’t outsource much so that they can maintain control over quality. Their competitors outsource more than half of their lines, most to countries outside the US. Dietz and Watson is made in Philly. They own and co-op most of their farms so they have better control of the food chain. They are a family company and they actually care. I used to work for them. They recently introduced ABF and Organic products which are verified by earthLLC. The same company who monitors applegate. It’s unfortunate that you’re all freaked out about MSG because it’s not harmful and nearly impossible to avoid. You should read this: https://fivethirtyeight.com/features/how-msg-got-a-bad-rap-flawed-science-and-xenophobia/ and then you should use your Google skills to find dozens of other articles on MSG by people who understand the chemisty of food that will tell you the same thing. As soon as you add salt to tomato sauce you’ve made MSG, so there’s that. It seems to me that people who offer nutrition advice should do some actual research from time to time. It’s not unpleasant once you get the hang of it. Thank you for this post. Found your blog at the top when I did a search for Deitz and Watson deli meats. I care about these things too. Thumanns… northeastern purveyor does not use msg in any product. They are certified gluten free. Boars head is not certified gluten free. Thumanns has an “all natural” line of deli meats. Thanks Mike, where do you live? I’ve never heard of them. I’m having a hard time trying to find out if Shoprite all natural turkey breast contains carrageenan. I was disappointed to find out that all from Applegate Farms does. I just want a safe, plain turkey to make a sandwich for lunch! I appreciate any suggestions! I know, it’s frustrating! Maybe try your local farmer? Boars Head is the most popular but not the best. They use MSG in their HAM. I don’t know what else it is in. Boar’s head cheeses are above par. Their meets are just average or less quality and above avg water added. Diets and Watson is way below AVERAGE on QUALITY and TASTE! I have a 3 way comparison, but I only have a 2 way comparison on-line. Sorry its is missing the Dietz/Watson data. Believe me Dietz is worst quality of all majors. Dietz is only brought into stores because of the cheap price and they are willing to wrap their product with the local store label. So for example you go to Shop-rite and get black bear for cheap. I think Black bear is Dietz meat. Black bear is good but it is good for its price. You wouldnt buy it at full price of $10.99/lb or more. Here in NYC, Gristedes supermarkets are all Dietz in their deli. Gristedes should change their name to GREEDIES. They sell the cheapest product and charge the most for it. Most supermarkets work on 100% markup on non-sale deli items. Gristedes works on 150% or more. They promote their prices by the 1/4lb to lure the customer. So they buy the Dietz turkey for $3.99/lb and charge $3.99/qtr/lb. If you want to try something healthier that actually tastes good try Thumanns. 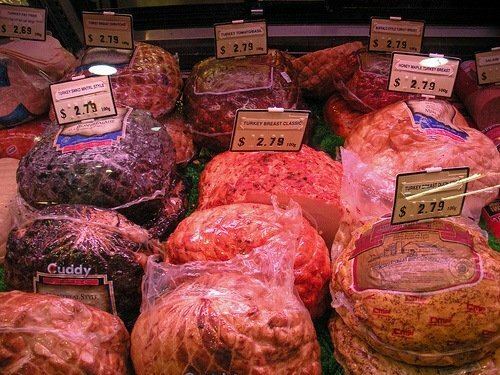 A lot of deli’s in NYC display Boars Head because the sheeple ask for boars head. But they slice Thumann’s because its actually a better product. im really surprised that of all the ingredients talked about here “dextrose” and “caramel color” wasnt in the list? both of those are just as bad and should be avoided. My grocery store’s deli is completely stocked with lunch meat rounds ready for slicing, and every single one contains “caramel color”….. its shameful. I really believe we need to go back to the way things were done in our great grandparents era. If they wouldnt recognize todays foods, then we shouldnt be eating them! Tried the maple honey glazed turkey by Dietz and Watson and boy was it mouth watering. Melted in my mouth. I enjoyed it also with an omelette and I smacked my momma it was so good; only joking. Yes I would recommend that if you like turkey with a sweet taste actual maple taste, try it!!! Oh well we’re all going to die from something. Now I’m going to make a big Boar’s Head Deluxe Ham and Genoa Salami Sandwich for lunch. My family is setting up a butcher shop as I type. Seeing the new movement of the world is to grass fed products is eye opening. As a few have stated just the “Grass” fed statement is open to say the least. Was raised on a 400 acre beef farm and if the field was sprayed for disease on the fescue then grass fed is not so clean and clear. Know your butcher and he is to know his suppliers. Great information. Dietz is far the better choice just understand which ones have the items not cared for. I only have one concern about “grass fed” meat – I’m all for it, but how do you know those animals’ grass was grown organically and are pesticide free? I wonder if the Feingold Association is aware of this website “oversite”. The clip below is on the D&W website under “Wellness”. The Feingold™ Association is a non-profit organization that works to create public awareness of how food and synthetic additives affect health, learning and behavior. Dietz & Watson products appear on the Feingold Association’s list of foods safe for hyperactive children and people with sensitive diets. I think it’s just that they are a less picky than I am. Or maybe they haven’t dug in quite as deep. The FDA approved a pesticide farmers use to spay all over our fruits and veggies from 40 parts per billion to 80 parts per billion. that means double the chemicals will be on all your veggies and fruits starting 2013. I always ask to read the ladel on any deli meat i buy at the supermarket. It is scary what really is in it. I found that Shoprite has stored baked turkey and has no nitrates in it. I buy it for my 6 yr old son lunches. To avoid confusion it is important to note that the “autolyzed yeast extract” and beef stock (most likely containing hydrolyzed vegetable protien) are sources of L-glutamic acid or free glutamate (the active portion of monosodium glutamate). “Free glutamate” is found in several ingredients as well as some unprocessed foods. If a packaged food lists any of the following compounds among its ingredients, it likely contains free glutamate: Autolyzed yeast, monosodium glutamate, maltodextrin, hydrolyzed or textured protein, yeast food, glutamic acid, yeast extract or yeast nutrient. The thing is to avoid overconsumption and obviously any actual added MSG. However, to avoid free glutamate completely, again, would be virtually impossible. Below are lists of amounts of free glutamate found in unprocessed foods as well as found in various products containg the ingredients mentioned in earlier posts. Here are amounts of free glutamate in 3.5-ounce (100-gram) samples of some natural foods, according to the FDA. Other researchers get different results, depending on the source of individual samples. Grapefruit (fresh, white): 10 milligrams. Cream of mushroom soup (MSG): 321 milligrams. Vegetable beef soup (HVP): 310 mg.
Chicken broth (MSG): 127 mg.
Soy sauce (various brands): 694 to 1,020 mg.
Soy sauce (label says no MSG): 490 mg. Potato chips (MSG): 157 mg.
Autolyzed yeast powder (various): 4,900 to 7,700 mg. Some of this stuff is falsehood. FWIW I agree with you on grass fed livestock. However, MSG is not beef stock and maltodextrin. Maltodextrin is an artificial sweetener and Beef stock is the juices from harvested meat. MSG stands for monosodium glutamate and is a flavor-enhancing preservative known by the brand name Accent. Also, in the comments, “autolyzed yeast extract” is not another name for MSG. all these meats are processed. If not, why is a turkey breast so huge when they pull it out of the cooler. No turkey breast is shaped like that. It has to be made the same as sausage. Yuk!!!! I try not to buy either Boar’s Head or Dietz and Watson; although I find Dietz and Watson to be a far more ethical company because they list their ingredients (good luck trying to find the ingredients list for Boars Head) and they don’t use bullying tactics with their Deli owners or customers. Overall, when I eat Boar’s Head Oven Gold Turkey (supposedly only turkey beast but you just have to look at the stuff to realize it’s still Turkey Roll) I get a reaction like I get when I eat foods with a lot of artificial flavors, fillers, and/or preservatives. And forget about real roast beef anymore, they like to say it’s 100% natural but it taste like processed junk. Now I go to the Italian Specialty store for my roast beef (made from a beef roast that’s cooked there and sliced – wow, imagine that real roast beef for the firs time in twenty years). Unfortunately they don’t do the same thing with their Turkey breast so I get that at Wild by Nature (100% natural real turkey sliced from a real turkey breast). Do yourself a favor and skip the brand name deli meats, not only are they unhealthy, they all taste more or less the same. Instead, pay a few extra bucks and seek out real meat. I live in Southern California in San Diego County. We have a Henry’s that will become a Sprouts. I did see Applegate Farm burgers so next time I will buy them. I know the Henry’s will be a Sprouts soon so that will be more Paleo/Primal friendly. What are some other brands I should look for? I wanted to know if there would be some special kind of labeling on the grass fed organic meat and some cheeses? I did notice on the ghee I bought it says made from pasture fed cows. 🙂 Would it say that on the grass fed meat? I want to go Paleo/ Primal and just found out I will have to take my food back to the store. I spent 15 bucks on boarshead meat, cheese, and foster farms chicken. I am sooo disappointed! Where can I find some truly gluten free meat? I want to buy organic and not get sick from corn and soy thank you! Will someone email me and help me? My email is above! Thank you in advance. Do you have a Whole Foods by you, that would be the first place to find better quality meats and lunchmeats. Applegate Farms is one brand they sell that is pretty good. Depends on where you live but there maybe some local farmers that sell lunchmeats and such. We have several here in MI, but I am not sure where you live. If you aren’t sure look online for your local Weston A. Price Chapter and call and they can help you find local farmers. I don’t know if anyone is still reading this post, but I’ll ask just in case =) Lisa, I am from MI too, can you give me info on what farmers sell lunchmeats? I’m in the Detroit area and would love to find some good organic lunchmeat! Just came across your blog and am very interested to know the farmer you purchase lunch meat from? I am from Grand Rapids too! My husband eats Dietz and Watson turkey everyday and I am concerned about nitrates. I can’t seem to find in their literature if it has nitrates or not and would much prefer to buy our meat locally, organic and preservative free as possible. where do you live, we are moving there!!! it is encouraging to hear that you are getting all that through your local farmer. We are on our searching mission for ours today! i am glad. very glad. The only thing I’d wonder about is how was the turkey raised, & “natural flavorings”. Did you try finding a farm nearby who makes lunchmeats?? The Hormel Natural Choice comes in a plain brown box at the store. The turkey ingredients are : Turkey Breast Meat, Water, Salt, Turbinado Sugar, Carrageenan (from seaweed), Baking Soda, Natural Flavoring, Lactic Acid Starter Culture (not from Milk). I am not the best with the label reading yet, but it seems this is the best I can find, short of a butcher making their own and stuff . . . . Sounds mediocre. Carrageenan is a thickener found in a lot of dairy products. It’s actually poisonous in large quantities. It can trigger flare-ups for ulcers, crohn’s disease, colitis, irritate IBS and much more. It’s good you read labels, but if you see this ingredients, put it back. I agree. Stay away from carrageenan. After going gluten free, i was still having symptoms on occasion depending on what i ate. Sure enough, after a lot of trial and error and monitoring everything i ate, i found that it was the carrageenan making me sick. It acts just like gluten with many of the same symptoms. Bad news is it’s in so many foods, especially non-dairy items like milk substitutes, yogurts, cheeses, etc. Always check labels! I have a question for Lyne…what is ET? Can you please help — by researching if Boars Head and Dietz & Watson use products (beef-cows, turkey, chicken) that come from animals fed with GM (genetically modified) corn or soy? I’m unable to find that info on their sites. Please continue to be nit picky and I will too. And we have the right to know every single ingredient in our food w/o calling the company. We have the right to decide whether we want .00001 of anything in our food. I agree, everyone should know what goes in and what it does. Anyone who puts their trust in a food manufacturer does so at their own peril. It pays to dig. I wish I could find some good recipes for making my own lunchmeats. We have done roast beef on occasion (we have a nice slicer in the family to make it thin), but I’d love to learn to make my own pepperoni. I had a recipe to make my own salami, and then realized one of the ingredients still had nitrites! I was so sad because at the time my son had neurological allergies that were very aggravated by nitrates and nitrites. Anyone know of a cookbook that would help someone do it themself? Maybe someone else knows of a cookbook, but all I can think of is for you to Google it like crazy, or maybe you already have? I have found many good recipes by Google searching. I got tired of worrying about what was in the sausages (even the “all natural” ones) because I am diagnosed with Celiac. Let’s face it, nobody in their right mind would put that kind of food restriction on themselves unless it was really needed!!! So now I make my own pork sausage, and recently went on to make lamb sausage too! It is very easy. The recipes are out there, and even if they use a seasoning brand you know you can’t eat, you can certainly replace it with one that is safe for you. You have to be really careful with “no msg added.” Swanson broth now has a “no msg added” variety, but it still contains autolyzed yeast extract (msg by another name, basically). Even Kashi and other “Healthy” brands of foods have been known to use AYE or Maltodextrin on products said to contain “no added msg.” As I’m allergic I have to be pretty careful, the truth in labeling site someone linked above was a HUGE help to me. Just have to let you know how much I admire and respect you, Kelly. I just love your site! I have not bought deli meat for years because I ,too, was trying to find the most “natural”. I think I drove them bonkers asking to read all the labels 🙂 Now I just buy chicken breasts or turkey breasts (when it’s on sale and freeze it.) and bake it with different seasonings. It is so much better and yummy. I greatly respect you, so please don’t take this response as anything but another opinion. I do find that it isn’t always about being nit picky. I have 2 sons who can’t have dairy, wheat or soy and can not tolerate much of anything that is a preservative or artificial colors or flavors. My 8 year old can handle a bit more than the baby. I am still nursing so I have to be very careful or he gets horrible rash, stomach upset and sinus problems. I am working on healing their guts (and mine) so they don’t have to suffer. But it does get difficult when things are labeled natural and really aren’t all that natural. I ask about everything. I can’t have any MSG, I get horribly sick (my mother-in-law swore it was the flu when she saw me have a reaction after eating out, nope that is what that stuff does to me within 1/2 an hour and it generally last for 12 to 24 hours and then I still feel yucky for about a day after the acute symptoms disappear). So it isn’t a “minor imperfection” to everyone. Plus if more consumers let them know that they don’t want that garbage in their foods, it will change the way things are marketed and processed. The pocketbook talks!! I am so glad you posted this. I have bought the brand before but not too often. Thanks to you, when I go out to eat I ask the waiter/waitress what kind of oil they use and the stunned look on their faces is priceless, plus at that point they are truly intriqued. As you know, people just don’t ask these kinds of questions. People automatically (my husband included) think the FDA etc. has our best interest in mind, it’s very heart breaking. As for the truth about soy that really grabs peoples attention. You are quite the leader. Great job!!!!!! The FDA approved a pesticide farmers use to spay all over our fruits and veggies from 40 parts per billion to 80 parts per billion. that means double the chemicals will be on all your veggies and fruits as of 2013. Kel, You’re sooo tenacious! Got hung up on? No problem. No MsG…let me check that out. Uh…only in a handful of products. Sheesh. No sugar? just on the outside. I’m no longer sooo naive. Gracias, mi amiga!! I’ve got to find the true website: this is a review site. Thanks for all you do. I’m inspired, once again. No head in this sand. ps. I’m going to an organic, Weston-Price inspired, whole food farmers market today. I’ll let you know! Kelly kells–wanted to make one point in response to your boarshead evaluation–the NO msg/nitrites bit ONLY applies to their “natural” line of products….there regular boarhead line most definitely contains all the bad stuff–i have SEEN the ingredients labels with my own eyes!!! 🙂 happy friday–wanted to let you know you inspired me to start my own food blog about my path….will hopefully be joining in on your real food wednesdays! so excited!!! thank you for your kindness and inspiration! If it means anything Target has a store brand called Archer Farms & a lot of their meats are completely corn/msg/soy free. My husband is allergic to corn & soy so it’s go to know! The deli people can print out a nutrition label for you if you have a question. No, I’ve never heard of them, sorry. Just be sure to check out their website then CALL to find out more. I was curious about Boars Head so thanks for bringing that up. Any thoughts on Primo Naturale? If you ever get to Detroit, we get our lunchmeats from Markowycz European Homestyle Sausage on Michigan Avenue. I go down there about every 8 week or so an stock up and put it in the freezer. They source their meats from Amish farmers in OH, IA and a few other states and they have a smokehouse on site and only use organic garlic, salt and pepper and spices. No filler, MSG, additives, etc. They will tell you what is in everything and their stuff is so good and their prices are comparable if not cheaper than the good lunchmeats at whole foods and the quality is FAR better!! Might be worth a trip to stock up and put it in your freezer. I thought that Boar’s Head was the same parent company as Dietz and Watson?? I know when their was a recall recently I thought it covered both companies?? I don’t buy commercial lunchmeat and haven’t in an while. I used to buy the applegate Farms at WF, but it goes off so fast, that we couldn’t finish it before it smelled bad. The stuff from Detroit stays fresh as it is fresh when you get it. KitchenKop. Obviously, you are another one of these food fanatics. I am not trying to say that there is anything wrong with eating healthy, but you should not make false claims. Ex: They asked: “Are you allergic to it?” I said, “Yes, everyone is actually.” This is referring to high fructose corn syrup. Keep your comments truthful please. Also, there is nothing better than old fashioned country cooking. Everyone should try it! Hi Bernice! It’s not the first time I’ve been called a food fanatic, lol. 🙂 When I said, “everyone is actually”, I think most people understand that I wasn’t implying they are *literally* allergic, but what I meant in a joking sort of way, is that NO one should eat that stuff, it’s bad for *everyone’s* health. So I live in a NW suburb of Chicago, Roselle IL. I seriously do not care for grass fed beef, personal choice. I do want to know where it is possible to find meats without the corn syrup AND nitrates. Any suggestions? I too, from reading labeled thought I was good to go with Dietz and Watson. I am very saddened by this article. Any suggestions would be appreciated. At $12.99 a lbs I was expecting quality and honesty on lables. Have you asked around at local butchers? We’ve got a couple great ones near us now who make homemade lunch meats (from pastured animals) that have no mystery ingredients and taste so good! Also, don’t give up on grassfed beef, a lot depends on how/where it’s raised. Or just use it IN things that you won’t notice the difference in flavor at all, such as ground beef in tacos, spaghetti, etc., or roast beef cut up & used in stroganoff for another idea.